It’s Wednesday, and Spring Break is going by way too fast! I think I enjoy Spring Break just as much, if not more, than the kids do. It’s time for a new sketch over at Freshly Made Sketches, and Jennifer Timko has a very fresh and clean sketch for us. 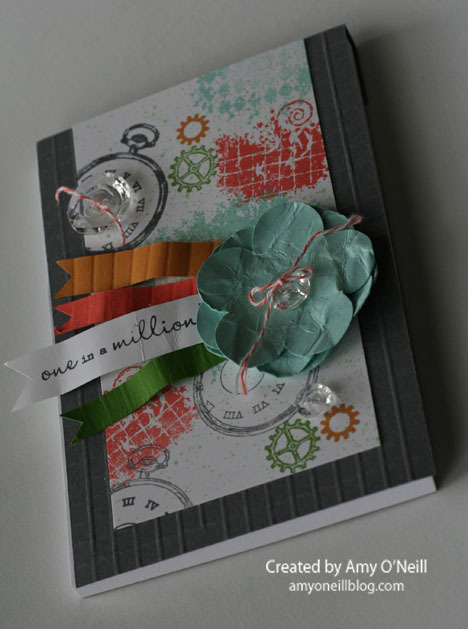 I used some of the Epic Day This and That suite of products — dsp and washi tape. I still love this suite! 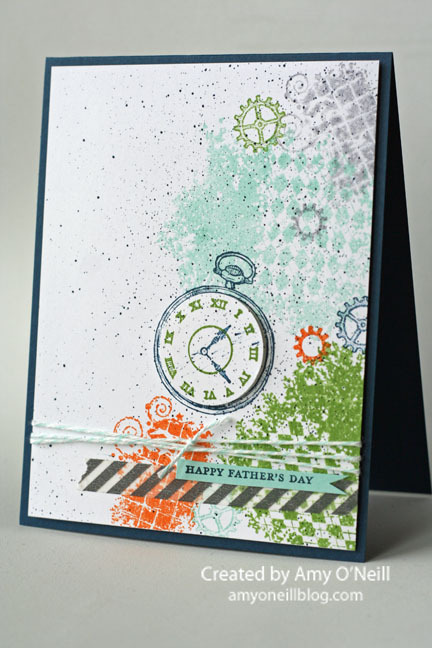 I also pulled out Gorgeous Grunge and Clockworks, two stamp sets I haven’t used in a while. I stamped off these images first on scratch paper before stamping the background on the card, as I wanted a subtle look. You can check out what the other designers made with the sketch at the Freshly Made Sketches site. 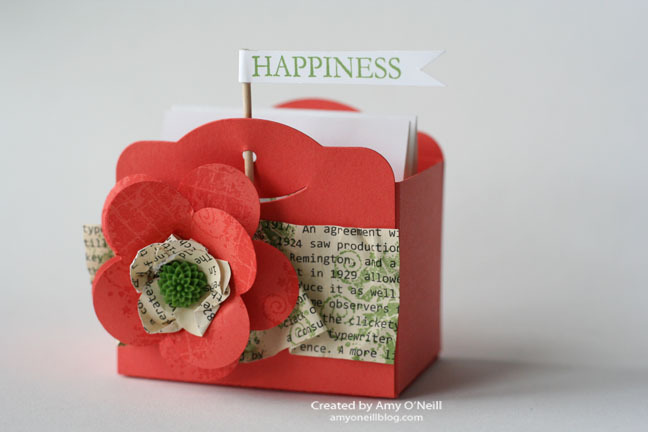 Then, we hope you’ll make your own card and post it to the gallery so we can admire your creation. I always struggle with Father’s Day cards (really, I struggle with manly cards in general). I decided to pull out my Clockworks stamp set (which hasn’t seen much ink) and play. One of the things I love about this stamp set is that you can’t really mess up. It’s just messy and fun. This first project is a notepad cover. They gave us a plain white 4″ x 6″ notepad, and we covered it with the embellished gray card stock cover. We scored the Basic Gray card stock first at 1/4″ intervals (it was supposed to be 1/2″ intervals, but I never can follow make & take instructions well). The flower was supposed to be on the left hand side, but I needed to cover a mistake, so I switched it around. I love these colors together – – Gumball Green More Mustard, Calypso Coral, Pool Party, and Basic Gray. This is the card we made. 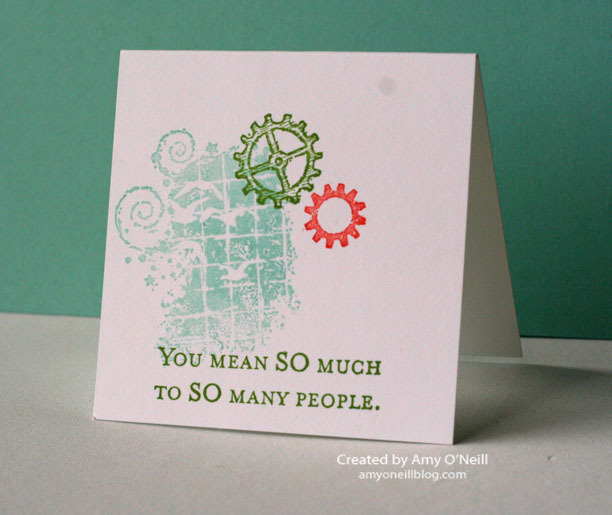 We used the spritzers to mist a mixture of rubbing alcohol and Gumball Green ink refill on the card base. We made a mask for the white panel and sponged Gumball Green ink over the mask to make the circles and green border. 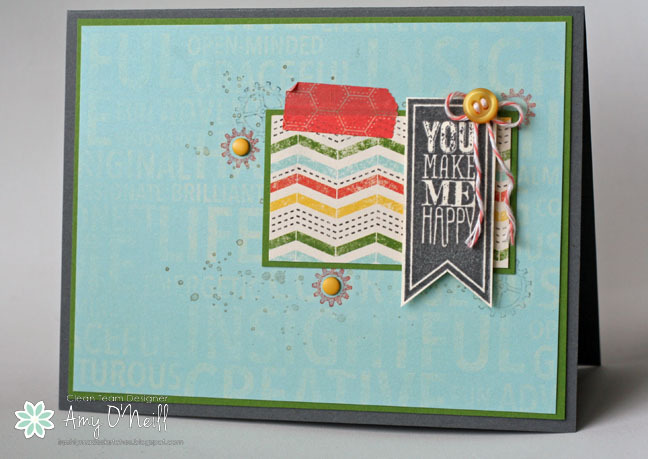 I hope you enjoyed the little peeks at some of the stamping from the Dallas regional event. Enjoy your Thursday! Thanks for stopping by!